Broadway here I come and Madison Avenue (Commercial Biz) I got the look. Hey, NY Actors or should I say Thespians. Let’s assume you can sing & dance for without that you “ain’t gettin’ a gig for Broadway” but always remember they shoot 1,000s of Commercials in Manhattan, they have an amazing amount of Modeling Gigs, even for the everyman/everywoman look, and, thanks to NY State’s Rebate/Refund Program and only NY looking like NY, they still cast 1000s of parts for Movies & Soaps there. Last Monday’s Blog was for LA/Hollywood based actors needing a list of Casting Directors and some knowledge how to find over 300 of them. Monday was West Coast… Now let’s go East Coast. So NY/EastCoast Actors let’s get a job and always remember (A) No one looks like you and (B) you are Unique and Original. Now it becomes a numbers game. Get yourself out to enough “CattleCalls” (aka: mass casting sessions, where you only have 2-3 minutes in front of the Director or Producer) in hopes of getting 2 “Callbacks” and a real acting job…. Go on enough CattleCalls and the Callbacks will come. Get enough jobs and the rest is up to you, your talent and how much G-d really likes you. 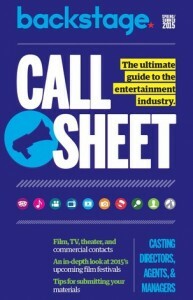 Again, every Pro Actor knows, unless you are famous, that you need to get 1 “CattleCall” and 2 “Callbacks” to get a gig. Now, how do you find out about the 100-200 Casting Sessions going on every week in Los Angeles/Hollywood/Santa Monica/Burbank/etc.? Simple. 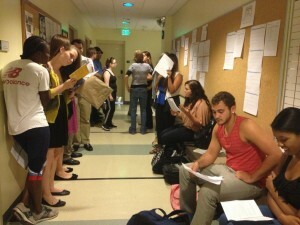 You get a Talent Agent who is a subscriber of “Breakdown Services” (more on this site, which, for actors, is a super-super important site) and you get in front of all the Casting Directors in your area who know about all the Casting Sessions and where to go and what time to show up for each “Audition”. 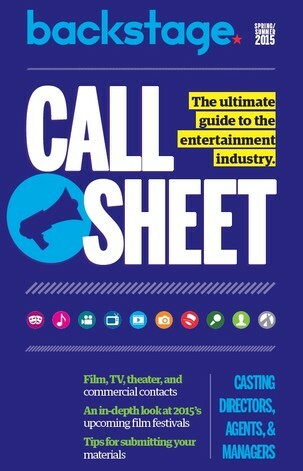 To find Casting Directors in your area, and especially, Hollywood then you get the bi-monthly magazine called “CALL SHEET”. It is published by “BackStage”, the weekly trade newspaper for actors, and you can find it at all newsstands in NY & Chicago. I will now open the most recent edition that has on the cover “THE ULTIMATE GUIDE to CASTING DIRECTORS & TALENT AGENCIES” and post the first 10 listings which alphabetically just cover the letter “A”. The saying is “You can lead a horse to water but you can’t make them drink”. Are you a T-Mobile customer? T-Mobile has released a feature that allows their customers to opt-out of business messages. In order to receive text messages from Central Casting, T-Mobile users will need to contact T-Mobile support at 1-800-866-2453 and ask for this feature to be turned off. Once the opt-out is removed, you will be able to receive messages from Central Casting. Even if you are a T-Mobile customer who has received text messages from Central Casting in the past, please check with T-Mobile to ensure you do not have the opt-out feature enabled.